This viewpoint is located high above the Geirangerfjord at Ørnesvingen on the road from Geiranger to Trollstigen, in Norway. 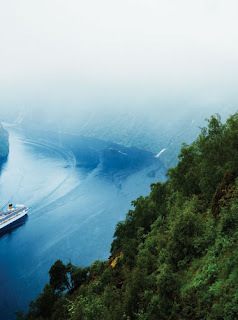 The fjord and its lanscape, where the viewpoint is located, is recently acknowledged a world heritage site by UNESCO. The project consists of three overlapping white concrete slabs overhanging the edge of a 600 meter vertical drop, enabling the observer to step out into the airspace. 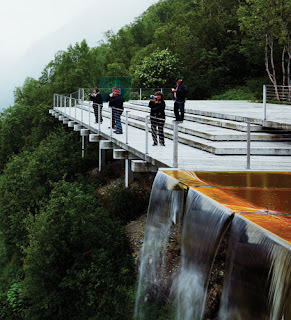 The river on site is guided over a glazed front, forming a waterfall on the very edge of the viewpoint.